The vocabulary of brain and spine disorders can be dense and unfamiliar. Patients, friends, and family members often find themselves thrust into this new language without warning, and soon learn that education is their first priority. This glossary is intended to explain basic neurosurgical terms, with links to more detail wherever possible. 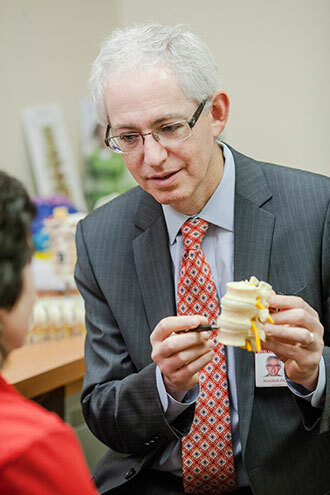 At the Weill Cornell Brain and Spine Center, we believe that we are partners with our patients, side by side in the journey to recovery. We'll always do our best to be sure you are well informed and well prepared to make the best decisions possible for your treatment. We're here to help. If there are additional terms you'd like to see added to this glossary, please use our Feedback form to let us know. Acoustic neuroma: A benign tumor of the hearing nerve (eighth cranial nerve), also called vestibular schwannomas. More about acoustic neuromas. Adenoma: A benign growth formed of glandular tissue. Allograft: A graft of bone or tissue between individuals of the same species. Allografts are usually obtained from cadavers. Aneurysm: An abnormal bulging or stretching of a weakened wall of a blood vessel. More about aneurysms. Angiography (arteriography): Imaging of blood vessels using injected contrast material (dye) to better visualize the vessels. The word is derived from angio (blood vessels) and gram (record or picture). Angioplasty: The reconstitution or recanalization of a blood vessel. Angioplasty may involve balloon dilation, the mechanical stripping of intima (innermost layer of an artery), forceful injection of a thrombolytic (clot-busting) agent, or the placement of a stent (vessel prosthesis). Annulus: The tough outer ring of a spinal disk. Anticoagulant: A medication that prevents coagulation of the blood. Aphasia: Difficulty with language, or the loss of use of language, in reading, writing, or speaking. This failure to understand the written, printed, or spoken word is not related to intelligence, but to specific lesions in the brain. Arachnoid: The middle of three membranes that cover and protect the brain and spinal cord. More about arachnoid cysts and sub-arachnoid hemorrhage. Arachnoiditis: Inflammation of the arachnoid membrane, most commonly seen within the spinal cord around the spinal cord and cauda equina. Arteriosclerosis: A thickening and calcification of the arterial wall with loss of elasticity and contractility. Arteriovenous: Relating to both arteries and veins. Arteriovenous malformation (AVM): A collection of blood vessels with one or more abnormal communications between arteries and veins, which may cause hemorrhage or seizures. More about AVMs. Arthrodesis: The surgical fixation or fusion of a joint. Astrocytoma: A tumor within the substance of the brain or spinal cord made up of astrocytes, often classified from grade I (slow-growing) to grade III (rapidly growing). More about brain tumors in adults or brain tumors in children. Ataxia: The loss of muscular coordination, abnormal clumsiness. Atrophy: A wasting of the tissues of a body part. Autograft: A graft of bone obtained from a patient for transplantation elsewhere on the same patient.